What is the largest Mpesa amount you’ve ever received on your phone in one go? Whatever amount it was, it is probably lunch money to Samuel Abisai. The guy who won the largest betting jackpot in Kenya’s history better frame this message and remind himself of the day his life changed. ”CONGRATULATIONS! 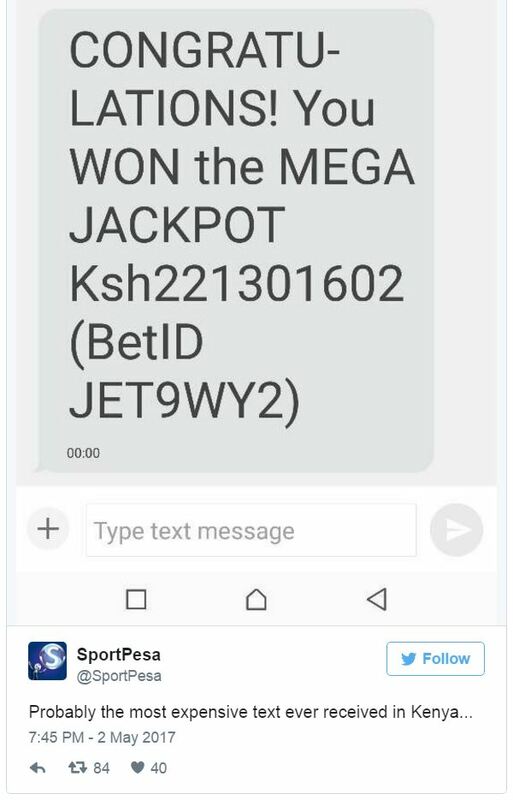 You Won the MEGA JACKPOT Ksh 221301602 (BetID JET9WY2)” read the text from the all too familiar Sportpesa shortcode 79079. The bookmaker shared it on Twitter, and it may very well be the most expensive text ever received in Kenya.